Over the years Novo Nutrition has put together several new versions of its delicious and very competitive Protein Wafer. In true Novo style, each version has been an improvement on the last, with this month bringing yet another edition of the long-running protein snack. Novo Nutrition’s has improved once again, in so many ways, which sees the brand continue to raise the bar in the not as busy protein wafer category. Macro-wise it still features the same kind of nutrition profile with 12g of protein from milk protein, 11g of carbohydrates, 14g of fat, for a total of 215 calories. There are three flavors of the new Novo Nutrition Protein Wafer, each of which features the same kind of consistency. Like most wafer products, it is a very light and easy to bite into snack, and best of all it doesn’t have any hanging, chalky aftertaste. 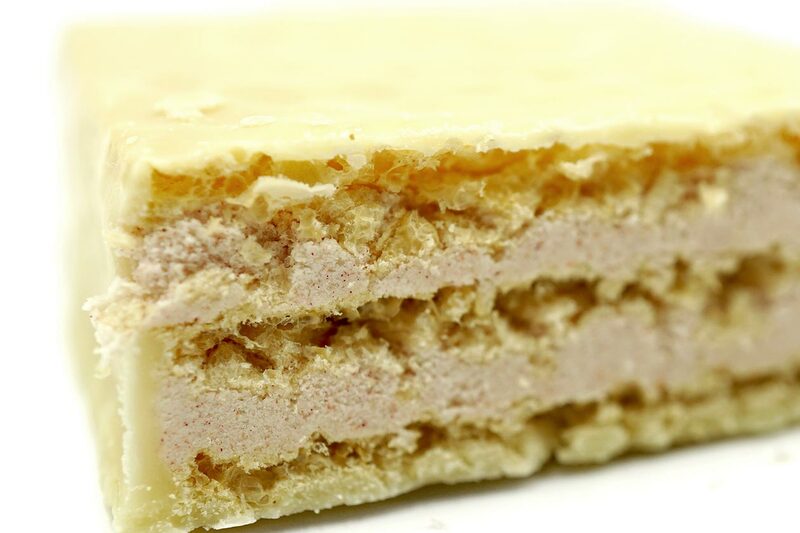 That dry, chalkiness is a big problem with most wafer style protein bars; in fact, some of Novo Nutrition’s past Protein Wafers have had that issue. For the 2019 version, there is a slight chalky side to it, although it’s only there near the end of chewing and it does not hang around after you’ve swallowed. The crispy and crunchy consistency of the Novo Nutrition Protein Wafer is made even better with its sweet and strong flavors. Of the three options, Vanilla, Chocolate and Strawberry, the last two on that list impress us the most and delivery a very well rounded experience. The Strawberry provides a light, but sweet strawberry taste along with a more dominant white chocolate outer that makes for a great mix of flavors. The Chocolate is a bit better in our books, packing a sweet and rich milk chocolate taste that also manages to hide that mid-chew chalkiness almost completely. Novo Nutrition’s new Protein Wafer is exactly what we expected with just a better product. Every time we try an updated version of the Protein Wafer, we always end thinking the brand couldn’t do any better, then months or a year later it does, which is indeed the case here. The Chocolate Protein Wafer definitely showcases how much Novo Nutrition has improved, as mentioned it almost rids the product of any typical wafer chalkiness. Overall, however, it still has the best consistency of any wafer we’ve tried and brings the snack closer to feeling like a non-protein wafer product.